The Island of Thassos is a real treasure for the country of Greece. Unlike the rest of the Greek islands, the Island of Thassos (Thasos) has much more to offer than just beautiful beaches and water. It truly retains all the Greek culture and tradition that has generally been lost on most of the Greek Islands, as they have become tourist centres that now cater to the many tourists of multi nationalities. 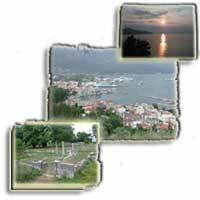 Thassos (Thasos) also has a rich history and archeological sites scattered through out the island. You can combine amusement with archaeological interests. An important reason for choosing Thassos (Thasos) for your holidays is the fact that it is the only island that lies close enough to mainland Greece to allow you to take excursions to many other archeological sites and beautiful cities that are spread throughout Northern Greece (Macedonia). Sea: The beauty is reflected in the crystal-clear waters that wash its shores. Environmental pollution is unknown here. Everything remains in a pristine state. Beaches: There are more beaches than on any of the other Greek Islands. Many of the beach's have trees coming all the way down to the beach. Apart from the developed complex on Makriammos beach and several campsites, there are fine, spotlessly clean beaches all along the island's coastline.